Electrophoresis buffers, reagents, and acrylamide are available as individual reagents or premixed buffers and solutions. Products include loading buffers for protein or nucleic acid samples, detergents, ampholytes, and gel‐casting buffers. Acrylamide powders, premixed acrylamide/bis powders, and premixed acrylamide/bis solutions are offered for handcasting polyacrylamide gels. Standard and alternative cross-linkers and catalysts are available. Bio-Rad offers a selection of agaroses suitable for IEP, IEF, and other specialty applications. Standard low, high, and zero -mr agarose are ideal for immuno-, counterimmunoelectrophoresis and IEF. Bio-Lyte® carrier ampholytes, supplied as clear aqueous solutions, are blended to give a complete range of isoelectric points for reproducible, linear pH gradients. Bio-Rad offers a variety of prepared solutions for casting polyacrylamide gels. Solutions for preparing the stacking and resolving portions of native or SDS-PAGE gels are available. Premixed sample buffers are available for numerous applications, including native PAGE, SDS-PAGE, peptide analyis, analytical IEF, nucleic acid sample preparation, and zymogram gel sample preparation. 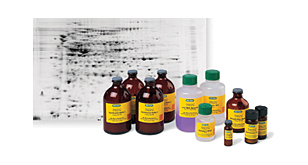 Premixed buffers are available for a variety of protein and nucleic acid electrophoresis protocols. The high quality 0.4 µm filtered buffers can be used with handcast or precast gels. Bio-Rad offers two tracking dyes for monitoring electrophoresis runs: bromophenol blue for monitoring protein electrophoresis and xylene cyanole FF for monitoring nucleic acid electrophoresis. Bio-Rad cleaning concentrate is a moderately alkaline detergent that cleans by solubilization and emulsification. It is ideal for cleaning glass plates and other laboratory equipment.